We currently are seeking a candidate to work as part of the team at St Bart's as a part-time Office Administrator. This position is 5 days per week, Monday to Thursday 8.30am to 3.00pm and Friday from 9.00am to 12.00noon. This year, our beloved Office Administrator, Jo Hockey, will be reducing her days from four to two in order to complete more study. As a result, we are currently seeking a suitable applicant to work a total of two days per week in a job-sharing arrangement. The position of Office Administrator is a diverse role that makes an important contribution to the life and work of our church. In combination with a range of administrative tasks, the role also has a pastoral element in the interaction with people visiting the church office, calling by phone, or contacting via email. The applicant will need to have a high level of attention to detail, superb organisational skills, the ability to learn quickly, and to multi-task efficiently. The applicant also needs to have clear communication skills (in person, telephone, and written), a willingness to be flexible, and the ability to work both autonomously and as part of diverse ministry team (volunteer and paid). We are seeking a mature and responsible person who has excellent telephone manner, is computer literate (with high proficiency with Microsoft Office), has typing skills, is able to personally assist the Senior Minister, maintain our databases, and carry out general office duties. Whilst not essential, applicants with graphic design skills and experience (particularly with the Adobe Creative Suite) will be considered favourably. This position will be two days per week and work closely with another employee in a job-share arrangement. This position is in compliance with duties which are now governed by Fair Work and in accordance with the Clerical Award. The office is open from 9.00 am – 3.00 pm, Monday to Thursday. There are no set educational or experience requirements for the position, however, the combination of both will be taken into account. Applicants should provide a CV, a cover letter, and two references. Applications should be emailed by Friday January 20 (5PM) to Adam Lowe at adam@stbarts.com.au (for more information call Adam on 0410 512 782). As we continue to advertise for this role, would you please consider who might be appropriate to lead this vital area of our church? This person could be lay or ordained, but essentially will have a great heart for God, a desire to care for others, and of course, superb pastoral skills. This is a fantastic half-time role that builds on a strong pastoral ministry at St Bart’s. Loving and caring for people is a core part of who we are as a church, and so we long for our coordinator to be empowered and released to take part in this ministry and build others up to do the same. A position-description is available in the foyer and on our website. If you have any questions or you know someone who could be suitable for this role, please feel free to chat with me at any time. St Bart’s is a vibrant and growing church, located in the beautiful city of Toowoomba (population 150,000) and 130km west of Brisbane. In order to resource and support our mission to make and mature disciples of Jesus Christ, we are currently seeking to appoint a part-time communications coordinator. The overall purpose of this role is to oversee our communications and marketing strategy, provide high quality design, and extend our digital reach. The communications coordinator will also work with our ministry team and volunteer leaders to better promote ministries and key events, be responsible for our website and social media presence, and help achieve our mission through the delivery of static and multimedia materials. Meet all requirements for safe ministry check. On board with vision of St Bart’s (especially that described in VISION 2020). Mature and prayerful Christian with a passion for Jesus. Strong ability to work as a member of the team. High level of creativity, being able to think out of the box. Proven track record in multimedia and graphic design. Ability to handle multiple tasks simultaneously and be highly organised, flexible, and personable. Highly proficient with the Adobe Creative Suite. Part-time role (8 hours per week – days are negotiable), reporting to Priest-in-Charge, Adam Lowe. Holidays: Four weeks (pro rata) per year. Remuneration as determined and negotiated. Applicants should provide a CV, a cover letter, and two references. Applications should be emailed by Monday November 21 5PM to Adam Lowe at adam@stbarts.com.au (for more information call Adam on 0410 512 782). St Bart’s is a vibrant and growing church, located in the beautiful city of Toowoomba (population 150,000) and 130km west of Brisbane. In order to resource and support our mission to make and mature disciples of Jesus Christ, we are currently seeking to appoint a part-time pastoral care coordinator. The overall purpose of this role is to oversee and grow the pastoral care ministry of St Bart’s, ensuring that everyone in our church is cared for. This includes coordinating a team of visitors (and ensuring that they are cared for); continuing to build significant community in the aged-care facilities in which we have a link; growing and developing the pastoral care team; and building upon existing ministries (e.g., emergency meals) and seek other opportunities to care for those in our community as an expression of the Gospel. Meet all requirements for safe ministry check and police check. Has completed training in pastoral care. Has experience in pastoral care and the leading of teams. Has a heart for people and can respond to human need. Is proactive and an excellent problem-solver. Has excellent listening and interpersonal communication skills. Mature Christian with a passion for Jesus. Strong leader and team player, able to inspire and work with others, organised and driven. Part-time role (50%), reporting to Priest-in-Charge, Adam Lowe. Holidays: Four weeks (pro rata) per year. Remuneration as determined and negotiated according to Diocesan scales (which is dependent upon qualifications and experience). Travel allowance (according to mileage) will also be provided. Applicants should provide a CV, a cover letter, and two references. Applications should be emailed by Monday November 7 5PM to Adam Lowe at adam@stbarts.com.au (for more information call Adam on 0410 512 782). I am so excited to announce that Stephen Urmston will be taking up the position of Children & Families Minister from January next year! This appointment is a great answer to prayer and part of the incredible fruit from the generous support of VISION 2020. Throughout the selection process it has been so clear that the Urmstons are exactly who God has had in mind for St Bart’s! There have been so many confirmations by numerous people throughout the process and an incredible reminder of the goodness and faithfulness of God. Bishop Cameron was also involved in the interview and if you were at the Training Day, you may have already very well met Stephen, Sarah, and James! Currently living in Melbourne, Stephen is married to Sarah and have a wonderful baby son, James. Stephen is currently completing a Masters of Divinity at Ridley College whilst also working in children’s ministry at St Jude’s (Parkville). Previously he has worked at Trinity Bay Church in South Australia. Sarah, who has a background in university ministry, enjoys spending time with James, crocheting, colouring in, and watching reality TV. Stephen has loved puppets for a long time and uses them wonderfully in ministry. He also really enjoys movies, and when time allows relaxing on the PlayStation. His biggest love however is working with children and families as we work out how to live out the gospel together. 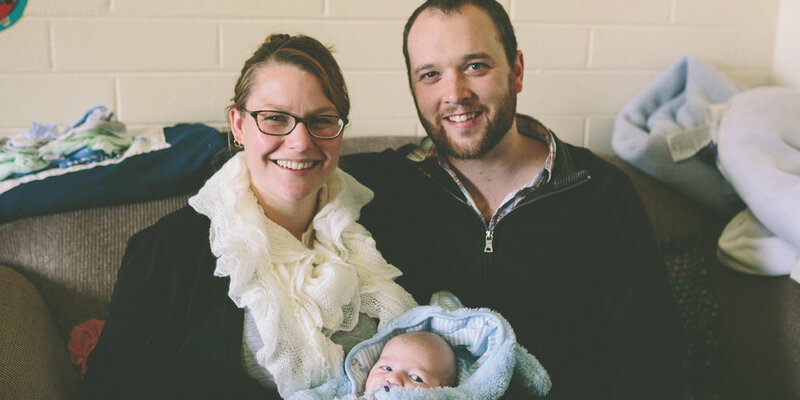 Please join with me in giving great thanks to God and please be praying for the Urmstons: that they will finish well in Melbourne and as they prepare for a big move. Pray for us as we prepare to welcome them as part of our St Bart’s family. While there may not have been much said in the past few weeks about this role highlighted in the Vision 2020 launch last year, the subject is very much alive. The second round of applications has closed and there are some promising applications received. These will be explored further during July and no doubt Adam will keep everyone up to date of any outcomes when there is something more concrete to report. As the old advertisement says, “it may not happen overnight, but it will happen”. Please keep the process in your prayers. St Bart’s is a vibrant and growing church, located in the beautiful city of Toowoomba (population 150,000) and 130km west of Brisbane. Toowoomba is renowned for its family-friendliness and temperate climate. Over the last twelve months St Bart’s has experienced a rapid expansion in the number of children and families involved in the life of our church. St Bart’s currently has 75 children as members of the church, and an average of 39 children (0-12 years old) involved each Sunday (but can be as large as 50). Each week, an additional 25 children (on average) are involved with mainly music and another 25 children with our Friday Kids Club. Children and families are a valued part of our church and require special attention. We currently have a rare opportunity for an experienced and passionate Children & Families Minister to join our team full time and make a real contribution to our church’s mission to make and mature disciples of Jesus Christ for God’s glory. Working full-time (38 hours per week - which will include Sunday mornings and some after-hours work as applicable), you’ll be responsible for overseeing, leading, and growing the children (aged 0-12) and families ministry at St Bart’s. You will help shape and implement our children and families strategy, identify and train leaders, disciple families, coordinate and participate in Sunday ministries (such as crèche, Sunday School, and our approach to children and worship), lead and coordinate our weekly Friday Kids Club, and liaise with other children’s ministries in our church (such as mainly music, mother’s book club, and religious instruction in schools). Depending upon experience and suitable qualifications, there is also the potential opportunity to preach on a semi-regular basis. Our successful applicant will have a passion for Jesus, a proven track record in children’s ministry, and be a strong leader and team player. We’re looking for an excellent communicator with well-developed organisation skills capable of managing a diverse range of competing priorities, expectations and responsibilities effectively. Tertiary qualifications in theology and/or ministry would be preferable, as would experience in preaching. Candidates must also meet all requirements of a safe ministry check and have a current Blue Card.